By Alyssa Ford Morel, Certified Master Gardener, Certified Master Naturalist and Audubon at Home Ambassador. 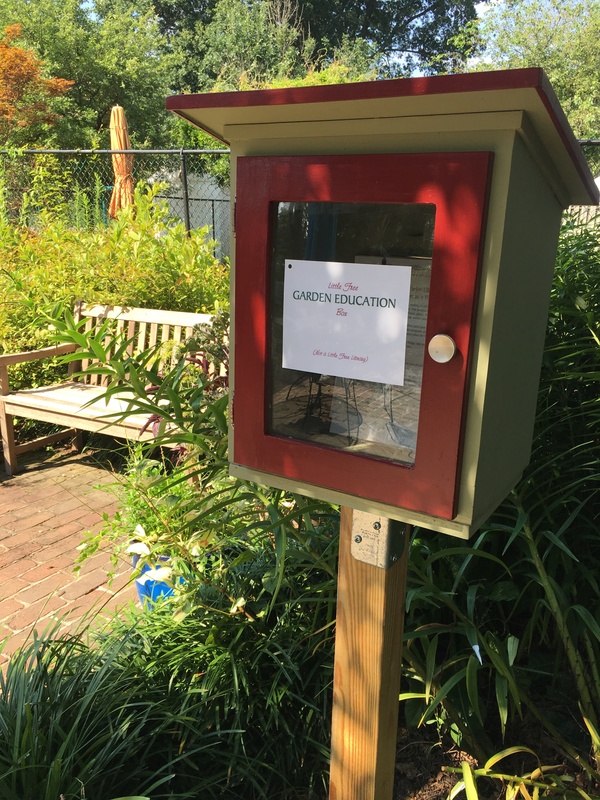 If you’ve visited Glencarlyn Library Community Garden’s back patio recently, it’s likely that you have noticed a new addition, a Garden Education box. Though it looks much like the Little Free Library boxes that have sprung up across the country in the past few years, the purpose of this one is much more specific to the garden: to provide visitors with helpful information related to gardening on an ongoing basis. Hoping to attract some of these beauties by becoming a Certified Wildlife Sanctuary. The first topic featured in the Garden Education box is Audubon at Home, a certification program for homeowners, churches, schools and others who want their spaces to serve as habitats for wildlife. 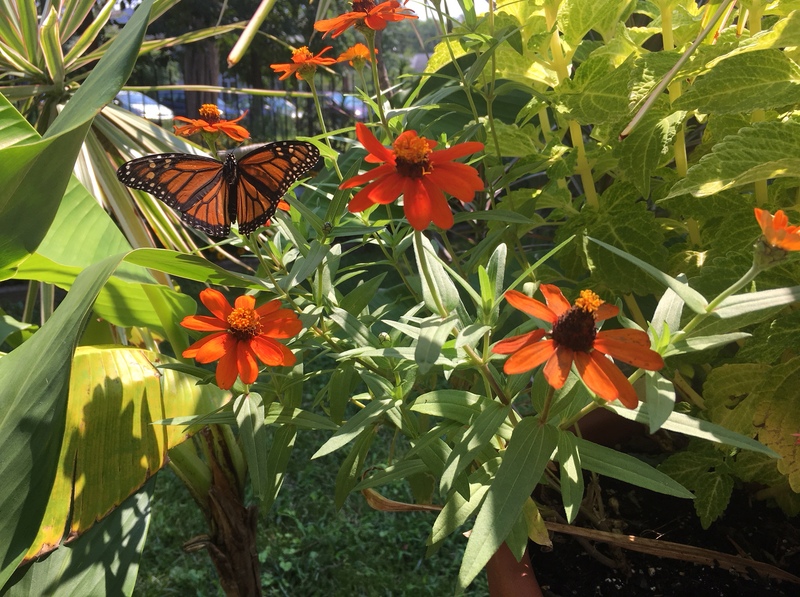 The Glencarlyn Library Community Garden is hoping to become a Certified Wildlife Sanctuary through the program and is inviting visitors to the garden to help it achieve that status. The Audubon at Home program has three elements. 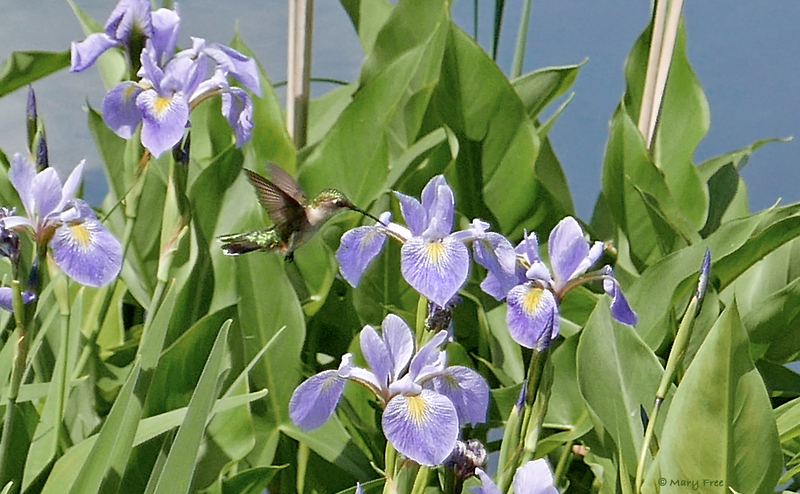 Ruby-throated hummingbird feeds on native Iris versicolor. First, an Audubon at Home Ambassador makes a visit to the property for which certification is sought. That visit allows the Ambassador to explain program elements to the homeowner, to see the space and identify all plants if possible, and explain whether they are native, invasive, or non-native non-invasive plants. The Ambassador then makes recommendations to help the homeowners make their yard more wildlife-friendly. This visit has already taken place at the Glencarlyn garden. Photo by Ian Barbour on Flickr. 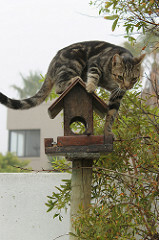 Guard against human-made hazards such as window collisions, light and noise pollution and poison rodent traps. Audubon at Home says that it “lets the animals decide” which spaces are wildlife friendly, and the third element of the program is documenting visits by at least 10 of the 42 “Sanctuary Species” locally designated by the program as needing support. The garden co-coordinators hope that garden visitors will look for and document those animals. Glencarlyn Library Community Garden Education Box checklist and information materials. To that end, the Garden Education box contains a checklist to mark down the Sanctuary Species seen, the date, what the animal was doing, and who saw it. To help identify the Sanctuary Species, a flip-book with information about each of them is also included, as well as a general information card. Also in the box is a binder of information about locally native plants, Tried and True Native Plants of the Mid-Atlantic, from the Master Gardeners of Northern Virginia, a project spearheaded by Garden Co-Coordinator Elaine Mills. The next time you are in the garden, please take an extra couple of minutes to look at the Garden Education box and the materials in it. Then take another minute to see if you see any of the birds, insects or other Sanctuary Species we are trying to attract, and make a note of it if you do. Your help would be appreciated. If you have any questions about Audubon at Home, or would like to have your yard become a Certified Wildlife Sanctuary, the best place to start is at the Audubon at Home Northern Virginia website. Audubon at Home is also planning to have an information table at the Glencarlyn Library Community Garden September 16 AutumnFest event. The Ambassadors there would be happy to answer any questions you have about the program, which is another great reason to come to Autumnfest! Alyssa Ford Morel is also a Co-Coordinator of Audubon at Home for Arlington and Alexandria, and a Co-Coordinator of the Glencarlyn Library Community Garden. 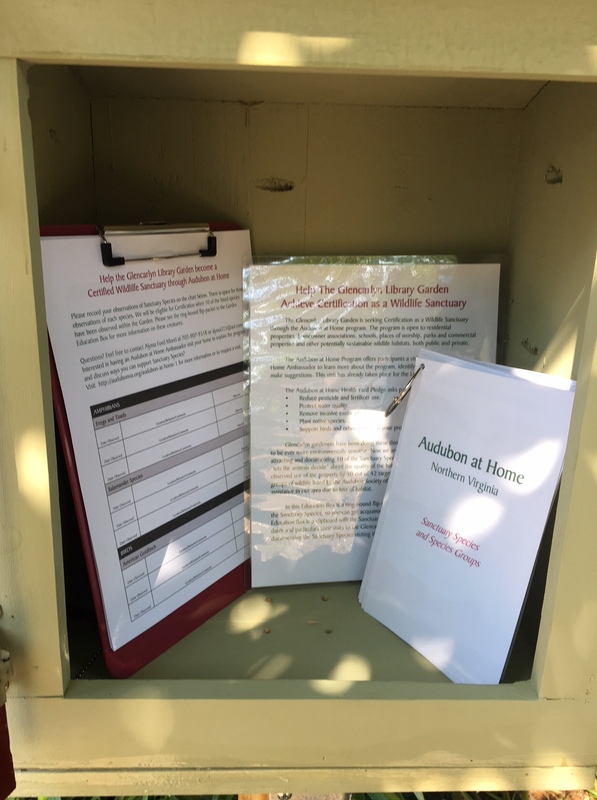 This entry was posted in Glencarlyn Library Community Garden and tagged Audubon at Home Wildlife Sanctuary Program, Garden Education Box, Glencarlyn Community Library Garden. Bookmark the permalink.